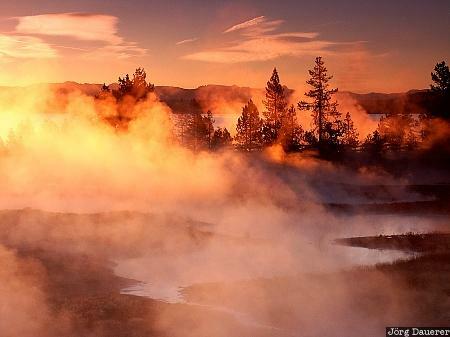 Sunrise behind the steam of the geysers at the shore of Yellowstone Lake in Yellowstone National Park. Yellowstone National Park is in the north-west of Wyoming in the western part of the United States. This photo was taken in the morning of a sunny day in September of 2003. This photo was taken with a digital camera.